“The Yellow Birds” by Kevin Powers | Mel Reads YA! 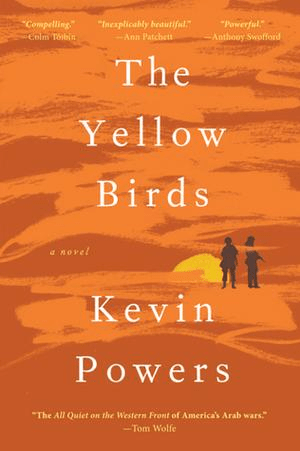 I rarely review books written for the adult market, but I must make an exception for debut author Kevin Powers’ exceptional new Iraq War novel, “The Yellow Birds.” This is a devastating novel about the effects of war, a topic, sadly, that remains ever relevant. Our local high school students read Ernest Hemingway’s WWI novel “A Farewell to Arms” and Tim O’Brien’s Vietnam War short story collection, “The Things They Carried.” “The Yellow Birds” is at least as relevant, at least as gut wrenching, and certainly as timely as those now-classic novels. When our nation’s wars are primarily being fought by teenagers and those in their early 20s, high school students should damn near be required to read a book like “The Yellow Birds.” In my humble opinion, anyway. Private John “Bart” Bartle, a 21 year old native of Richmond, Virginia, has been deployed to Al Tafar in the Nineveh Province of Iraq in the fall of 2004. This is a volatile region, with streets taken and surrendered in brutal fashion, with random violence, mortar attacks, gunfire, and, everywhere, without end, death. The action flashes back and forth to Bart’s pre-war training in Fort Dix, his drunken despair at a German bar / brothel with the heroic and deeply flawed Sergeant Sterling, and Bart’s lonely disconnection and unraveling at home in Virginia. We know early on that Bart’s closest friend, 18 year old private Daniel “Murph” Murphy, is dead. We slowly discover what happened and how Bart failed to fulfill a spontaneous promise to deliver Murph home safely. What we see clearly, even without knowing the details of Murph’s death, is Bart’s pain, his jagged grief at his perceived cowardice, the disorientation of living in a constant war and adjusting afterward, and the soul-crushing burden that witnessing, causing, and ignoring so much death creates. There are many scenes that depict the terror and chaos of war: an interpreter is shot on a rooftop in mid-sentence; a disemboweled boy dies in agony after a gunfight in an orchard; a human bomb explodes, raining human matter down on a bridge; and a young girl feebly tries to drag an old woman’s dead body across a dirt road. There is dust and blood and all manner of sickening odors and deafening sounds. Everywhere. All the time. Powers, a veteran himself, does an astounding job of conveying how war floods the senses, overtakes the brain, and strangles even basic human compassion. Powerful stuff. For all barbarity of war and the awful claustrophobia of alcoholism and post traumatic stress disorder, Bart achieves a measure of peace by novel’s end, giving “The Yellow Birds” a kind of quiet victory in simply showing the soul’s ability to survive. Some years later, alone in a mountain cabin, Bart is able to, as he says, become ordinary again. “There are days ahead when I won’t think of him or Sterling or the war.” Yes, that’s a small triumph, but it is still a hopeful note in a novel about how violence ravages its victims, perpetrators, and our larger society. I think high school students, or those young people with the maturity to handle some incredibly jarring — but never gratuitous — imagery and language, should read, analyze, and discuss “The Yellow Birds.” In a mere 226 pages, Kevin Powers has created what is destined to become a masterpiece of modern fiction. Please read this National Book Award-nominated novel now. You will never forget it. And keep this stunning book in mind the next time some politician somewhere argues for the deployment of US troops.